When starting this segment I didn't think I'd come across an Australian beer worth putting in it. Of course I'd forgotten about this little beauty from Broome. I had this beer as part of the alphabet challenge that spurned the idea for Beer O'Clock Australia, lets see how it stands up to it's Belgian contemporaries. 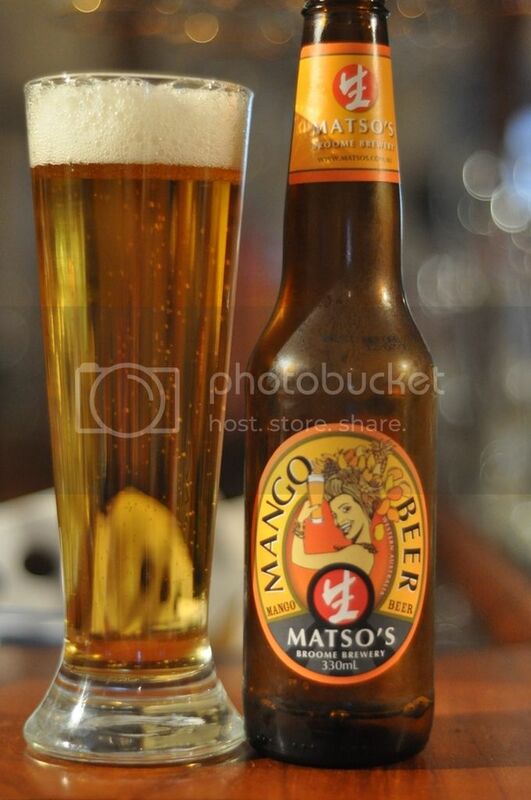 Mango certainly isn't a traditional fruit used in the making of fruit beer. The back of the bottle claims it's based on a traditional Belgian recipe, which I find very hard to believe, where would Belgian's get mangoes from? That's neither here nor there though, it's made using 100% natural mango fruit blend, and should be refreshing if my memory serves me correctly. Unlike most fruit beers this one actually looks like a beer when you pour it, this is obviously helped by the light colour of the mango. The white head is maybe 2 fingers high at it's peak, but it has lots bubbles in it and subsides to nothing very quickly. We were actually quite lucky to get a photo showing off this much head, thats how quickly it disipates! There's not alot more to say than it looks almost like a lager, this beer is about so much more than the appearance though, lets see how it smells. Upon pouring this beer you are instantly hit with a strong smell of mango, unsurprisingly! The nose is almost entirely madeup of mango flavours, but it is by no means too sweet. In fact the nose has an uncharacteristic tartness whilst still retaining it's mango aroma. There are some hints of wheat and mild malts, but they are almost non-existent. A very mangoey aroma! The flavour is excellent actually, the lovely malt bed is light allowing the mangoes a chance to shine. And shine they do, they are fresh and seem real, nothing artificial in this beer. It's by no way sickly sweet though and is actually balanced very nicely by this strange bitter mango flavour towards the back end of the beer. It is a tiny bit thick and could become cloying if drunk in excess, however with the one I've had it's pretty much the perfect fruit beer, very refreshing and an excellent exhibition of the fruit. I think I understand what the back of the bottle was trying to say after tasting this beer. I think they meant to say that the beer is a traditional Belgian Blonde with mango blend added. The Belgian Blonde is light and dry and actually has lovely malts with mild fruityness. It's a really easy drinking fruit beer and with the slight tartness at the end is almost balanced. It's incredibly refreshing and I would definitely buy this again, I'm also recommending this to everyone it's a quality fruit beer and reasonably priced.